Esta característica está disponible para los usuarios que aceptaron las cookies de Banner Engineering. ¿Le gustaría aprender más o cambiar sus preferencias de Cookies? Su Usuario y/o Contraseña no coinciden con nuestros registros. Inténtelo de nuevo. El documento estará disponible en su biblioteca hasta el final de su sesión. Para guardar de forma permanente, cree una cuenta. Minneapolis, MN—July 12, 2016—Banner Engineering has expanded its family of L-GAGE® laser sensors with the new LTF Series. Featuring time-of-flight technology, the laser measurement sensor ensures accurate distance measurements out to 12 meters. By emitting a pulsed light, the LTF measures the amount of time for the light to reflect off the object and return to the sensor to calculate the distance. This enables sensing in long-range applications, including loop control, part presence or absence and fill level. The LTF offers the best-in-class combination of accuracy, repeatability and range. 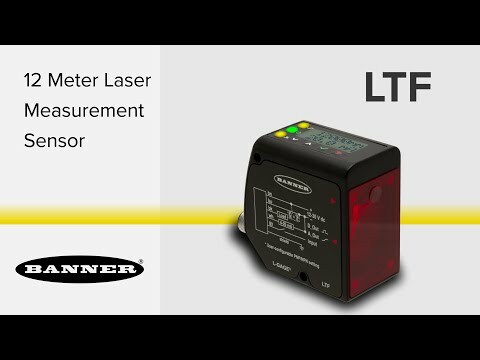 Designed with a Class 2 laser emitter with small, highly visible spot, the LTF provides easy sensor alignment and high excess gain. The same sensor that provides repeatability of less than 3 millimeters and accuracy of plus or minus 10 millimeters can also reliably detect dark targets past 7 meters and white targets at 12 meters. In addition to precision distance measurement, the LTF delivers consistent detection of targets regardless of the angle, environmental conditions or ambient light resistance. The dynamically adjusted laser sensor can also sense objects with varying materials and shapes. The laser power increases output for dark targets or objects at steep angles, while reducing power for shiny targets. With easy, ready-to-use operation, the LTF starts measuring right out of the box. In just three simple steps, the sensor can be quickly mounted, aligned and provide real-time measurement. Users can also select from several TEACH modes, including 2-point teach, mid-point teach, switch point teach and push button adjust, to accommodate diverse applications. Advanced measurement modes, delay timers and cross-talk avoidance capability are also available. Featuring an intuitive two-line, eight-character display, the LTF makes adjustments and menu navigation simple and easy to read. Additionally, the bright LED indicators provide clear status indication for analog output, discrete output and power. To satisfy applications in harsh environmental conditions, the LTF features durable IP67-rated die-cast zinc housing. La serie de sensores LTF de alto rendimiento detecta objetos a una distancia recta o en ángulo, hasta a 12 metros de distancia sin importar el color, material o brillo. Los usamos para brindarle la mejor experiencia en nuestro sitio. ¿Le gustaría aprender mas? Lea nuestro [aviso legal] antes de continuar. Al hacer click en Aceptar, usted estará de acuerdo con nuestros términos y condiciones y luego puede proceder a su descarga.